What is the price of an A380? Yesterday, it appeared in Flight International website, an article in which the price of an A380 was unveiled. Generally, aircraft real prices are never disclosed, that is why that was news. What it is normally published is the list prices for the different aircraft (here you may see Boeing’s list). The article disclosed the price for an A380 acquired by Nimrod Capital LLC, which is to lease it to Emirates. The price: 234m$. Since the list price for the A380 is 375m$, that means it was purchased with a 38% discount, as the article says. For obvious reasons, I will not comment on Airbus prices (*). 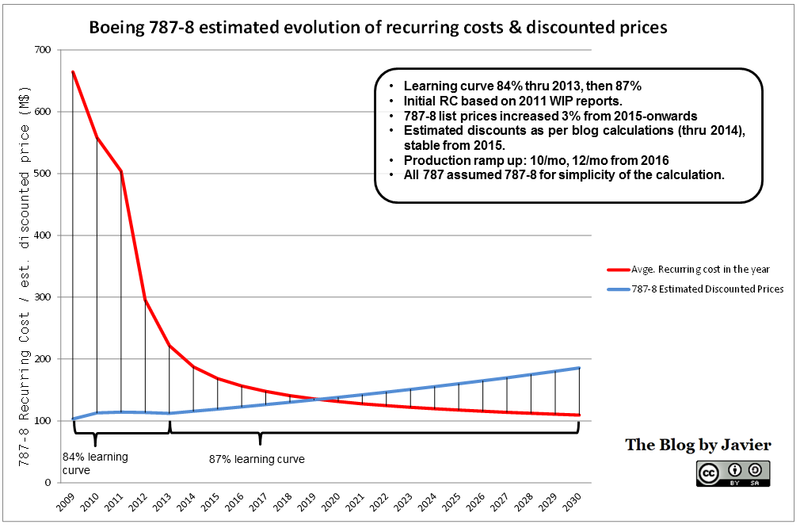 Here, I just wanted to mention that, using a quite detailed approach, some time ago, I calculated which were Boeing’s discounts. I explained everything in a post. I used the number of aircraft delivered per year, the net orders per year, all for a period of three consecutive years, and matched the list prices versus the revenues recognised in the yearly income statement published by the company in each of those years… I figured out which was the discount that minimized errors for the period of three years. Guess what was the result I came up with: 38% for the period 2007-2009 and 39% for the period 2008-2010. (*) Disclaimer: I have never worked in anything related to aircraft pricing, sales or marketing in Airbus. Thus, I have no insider clue about its prices. 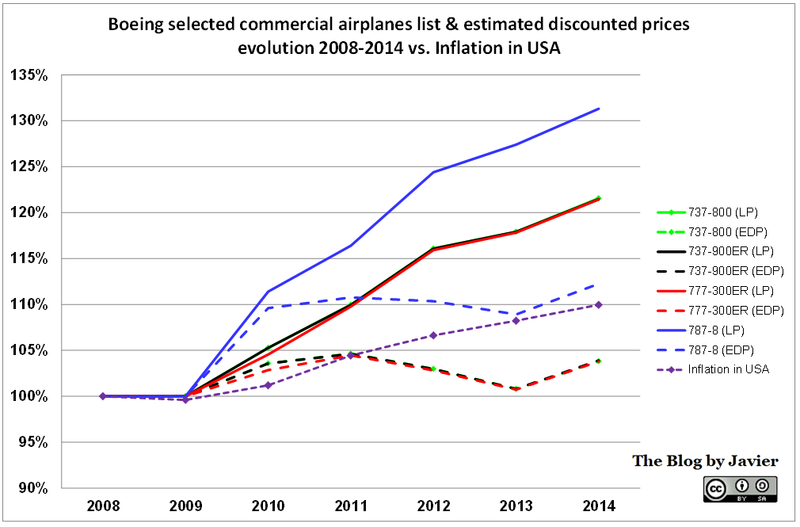 In an older post I already made an analysis of the aircraft discounts related to the published list prices (by the way, Boeing just raised its list prices 5.2% a couple of days ago). 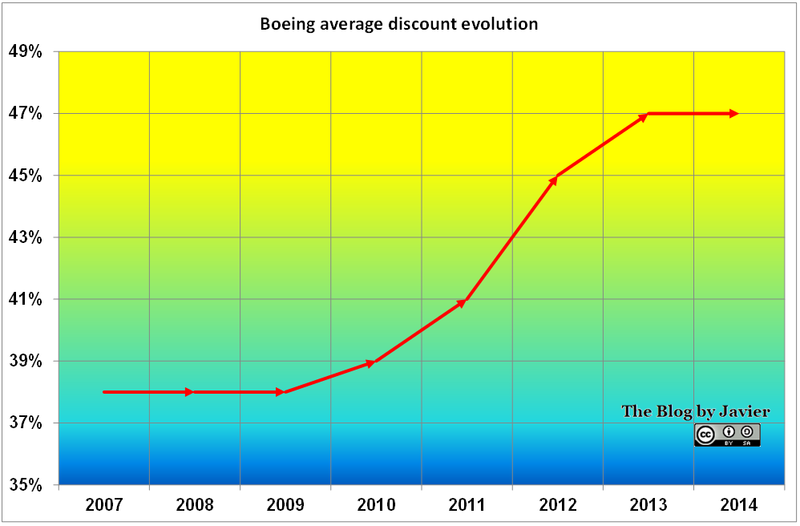 In that case, I used the revenues and deliveries of Boeing in the previous 3 years (38% discount was the result!). Using that information, now that the latest market forecasts both from Airbus (Global Market Forecast) and Boeing (Current Market Outlook) are available, we can say that the real market size in the next 20 years will be in the order of 2,100bn$ (average of both forecasts in 2010 dollars). 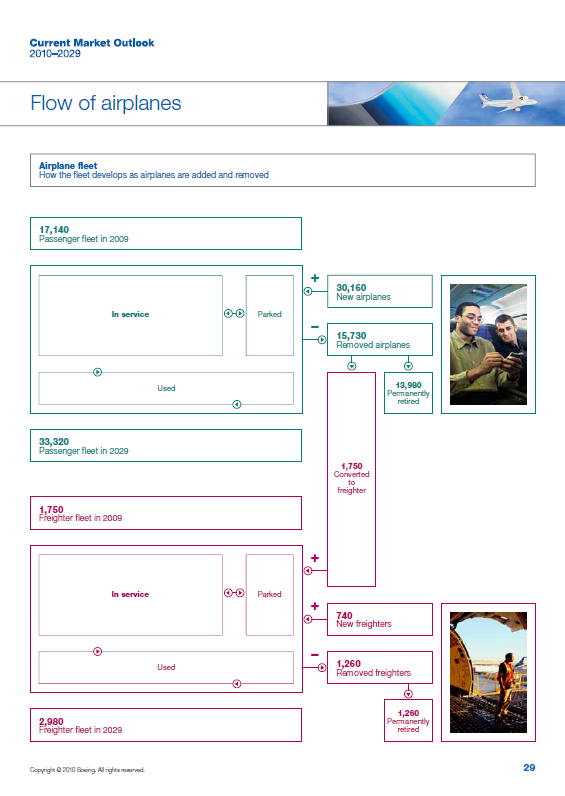 Another very interesting feature that Airbus published in last year’s GMF (it is not yet in this year’s publication) and Boeing used for this year’s CMO is a graphic showing the dynamics of aircraft. 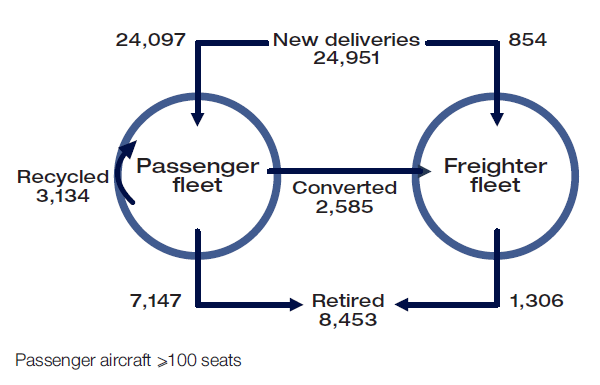 In it you may understand how from today’s fleet, adding new deliveries, retiring old aircraft, converting some from passenger to freight transport they arrive to the forecasted fleet in 2029. I include below both graphics. Airbus flow of a/c, GMF 2009. Boeing flow of a/c, CMO 2010. Airbus announced on Monday its latest Global Market Forecast (PDF, 4.6MB) for the 20-year period 2010-2029. Media has already highlighted the main points: ~26,000 new aircraft will be delivered with a market value of ~3,200bn$. Some months ago, Boeing published its equivalent study, the Current Market Outlook (PDF, 8.2MB) for the same period. It is interesting to compare the two of them. In that way we can see how each other treat competitors’ products (mainly A380) and how they try to shape the market and send messages to it (point-to-point & hub-spoke). 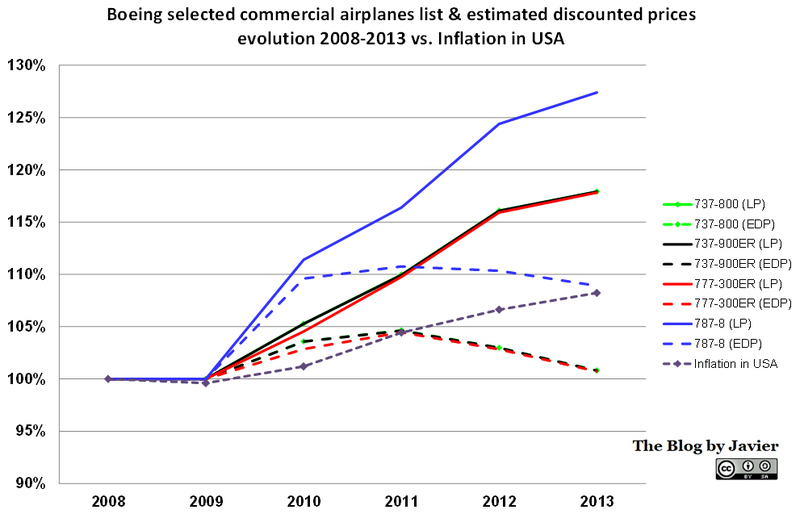 Comparison of Airbus GMF and Boeing CMO 2010-2029. Boeing sees demand for 13% more aircraft with a 10% more value. However, this higher demand is not applicable to all segments: Boeing sees ~60% less A380s or equivalent being delivered over the next 20 years, while 18% more single aisle (A320s) and 12% more twin aisle (A330/A350s). Boeing plays down A380 potential, but sees a very similar number of RPKs (“revenue passenger kilometer”), that is, the number of paying passenger by the distance they are transported. Airbus forecasts for 2029 12.03 RPKs while Boeing forecasts 12.60 (in trillion). The difference of less than 5% in RPKs means that out of the 13% difference in aircraft deliveries over 8% comes from the different business model each company is trying to push. Finally, we can see that Boeing uses again higher average prices for smaller aircraft and a lower reference price for A380s. Enjoy the two documents, differences apart, they gave a very good piece of information and insight about the market.